Growing Fig Trees in Virginia – Fig Trees Are Here! Dandelion Greens: Weeds or Food? Dandelion greens: are they noxious weeds ruining a perfect lawn or the world’s healthiest food trampled underfoot? Dandelions are some of the most recognizable lawn “weeds” in the world. I’m sure every child of your acquaintance has brought you a dandelion bouquet or blown dandelion clocks on a warm summer’s day. I think dandelions were the first wild plants I learned to recognize in my childhood in urban Long Island, New York. Why do we hate dandelions so much? 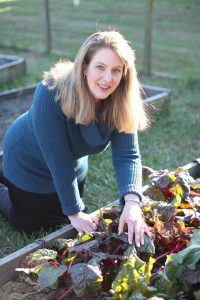 I just completed a fantastic course on Learning Herbs/Herb Mentor taught by the late great Dr. Peter Gail, the “Wizard of Weeds.” What I learned really opened my eyes to the dandelions and why we view them as weeds – when they are really gourmet greens packed with astonishing nutritional value. A word about picking wild plants: Never eat any wild plants that you are not 100% sure of – always be certain of the identity of what you decide to eat. When in doubt, don’t eat it. Also, be careful to pick through any wild plants harvested to make sure you do not accidentally eat anything caught among the leaves. It might be smart to take a local foraging class or to have an expert come to your yard to identify your plants. Remember – when in doubt DO NOT EAT IT! If dandelion greens are so good for you, then why do Americans hate them so much? I mean, take a look at the lawn and garden aisle at the garden center. 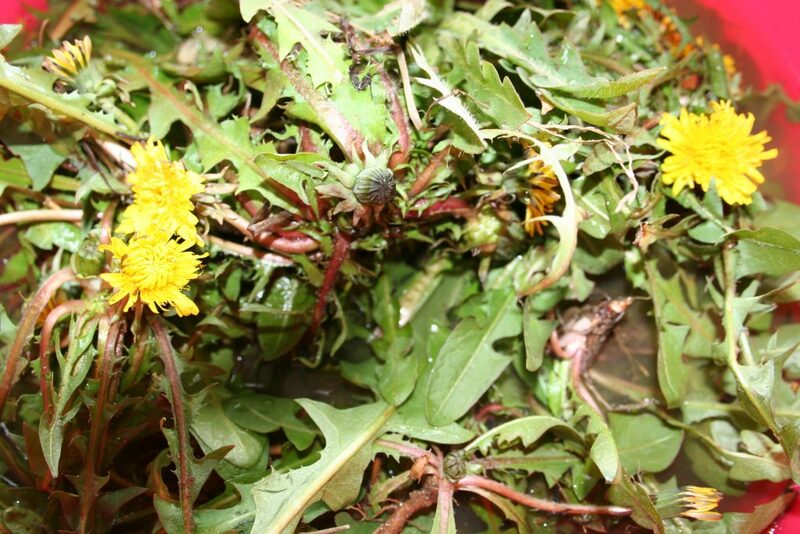 There are products to kill every kind of weed…and the humble dandelion is usually pictured on the label. I heard a professor says that the reason why Americans hate dandelions and other ‘weeds’ other cultures worldwide enjoy as cuisine stems from the end of World War II. At that time, men returned from war. They wanted to get married, buy a house in the suburbs, and settle down to the idyllic promise of a life in the ‘burbs. With that came the rise of the subdivision. Towns such as Levittown, Long Island, and the now ubiquitous suburb made the quest for a smooth, perfect green lawn a ‘thing’. I look at pictures of my grandparents sitting in their backyard in Richmond Hill, Queens, in the 1910s and 1920s and I see a lawn but I also see weeds happily mixed with the garden. The lambs’ quarters and other ‘weeds’ were eaten right along with the tomatoes and lettuce. Lawns are unnatural. Lawns are an outgrowth of 18th century ideals of beauty for the wealthy in England. The amount of money Americans spend each year on their quest for a beautiful lawn is astonishing. What if, instead of pushing for that beautiful lush green lawn, we instead embraced the weeds? Maybe…ate the weeds? 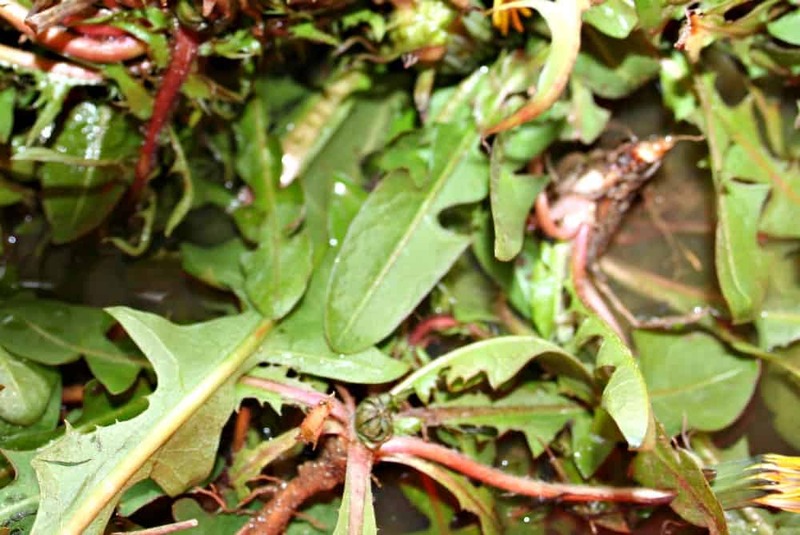 As long as we choose the right weeds, carefully foraged and with the knowledge to know what is poisonous and healthful, we could be throwing out a wealth of nutritious FREE vegetables each year if we pull, spray, or trample healthy weeds like dandelion greens! Dandelion greens picked from my lawn and garden and waiting to be cleaned. I sort, clean, and cut up the greens and eat them raw and cooked. Think about that for a minute. If he is right – and he’s a well known and noted Ph.D. with a long history of studying the dandelion plant – we are killing off millions of these plants yearly for the sake of the “perfect” lawn when in fact the plants themselves may be able to help your body heal whatever is ailing it! Yum! Some people see weeds, I see lunch. Look what is free for the taking. All those vitamins, growing in your lawn. Now do you still want to spray them? Not only are dandelions good for people, but in some parts of the country, the flowers are some of the first pollen sources for bees foraging after their long winter. If you spray the flowers and the plants now, you’ll reduce the amount of food available for bees early in the season just when they need it the most. I’ve put together a Dandelion Recipes Pinterest Board just for dandelion greens recipes. I can’t vouch for all of the recipes, but I did make a few, and added one of my own which I will unveil on Friday for #foodieFriday. Check them out and try them out if you know for sure you have dandelions – not sprayed with herbicides – in your garden. 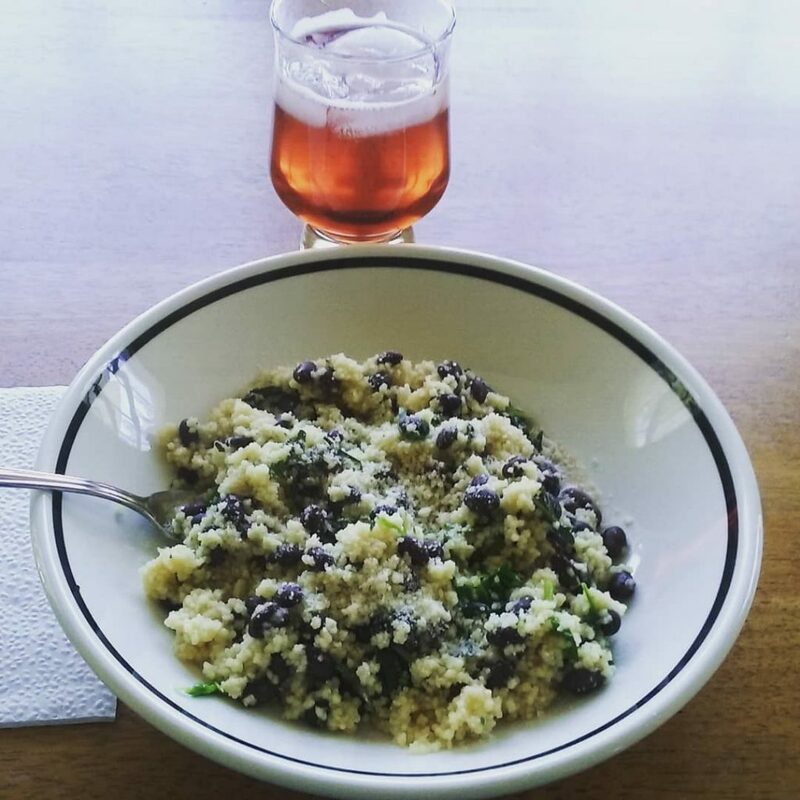 Lunch made from couscous, black beans, dandelion greens and chickweeds. Delicious. One thing that puts people off of enjoying dandelion greens is the bitterness in the leaves. Young, tender leaves are less bitter, but if even these are too bitter, there is a very simple solution: sweetener. 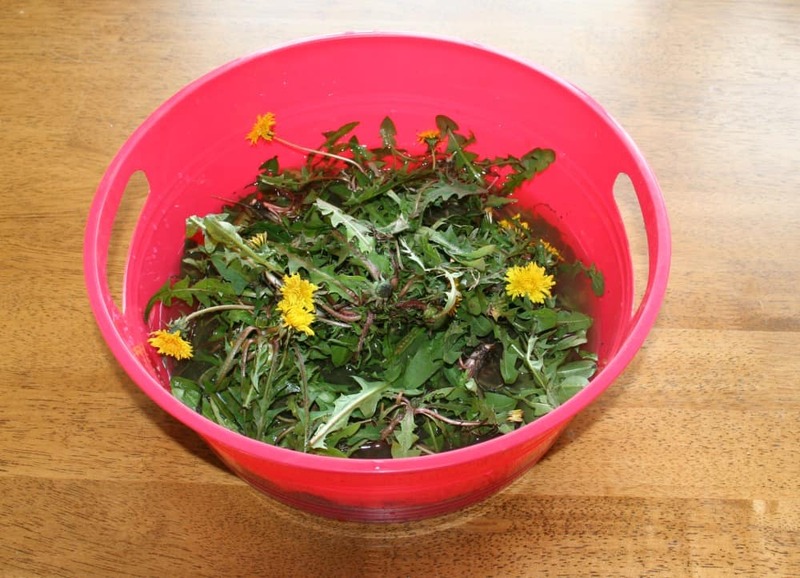 Mix a salad dressing of cider vinegar, oil and honey and use that as your dandelion green salad dressing. The honey reduces or eliminates the bitterness altogether. Dandelion herb, or dandelion as an herb, has a long tradition of use. Instead of killing dandelions in your yard or pulling them up, why not embrace them? “You are what you eat” is more than a clever saying. By incorporating more healthy greens in your diet, you’ll enjoy better health. Dandelions are a great free way to do this.